Whether you are building your own bike from scratch or looking to replace a wheel on a bike you own and love, you know that choosing the best mountain bike wheels will determine the quality of your ride. A right wheel takes an average mountain bike from enjoyable to professional. Not only that; the statistics of the bike wheel- that is, its width, rim height, and the details of its make determine the abilities of your mountain bike. With such a wide variety of wheels from which to choose, we know that it can get confusing: and that’s why we’ve collected a list of the excellent mountain bike wheels for your perusal. Remember that if you want to fit some new wheels you should really use a repair stand to do so. The Sta-Tru mountain bike wheel that is as durable as it is sleek. It is made from the highest quality materials that have been thoroughly tested to ensure the bike wheel’s durability. Through rough and tough terrain and heavy riding use, the Sta-Tru Mountain Bike Wheel will hold up and remain the attractive, good bike wheel you need it to be. That is why expert riders choose to use the Ste-True Wheel, all across the world. This mountain bike wheel is an attractive silver color that matches any mountain bike colorations. The alloy rims feature 36 holes designed to increase strength and durability; the wheel is made from high quality aluminum that makes it light, yet sturdy and durable for years to come. The wheel is twenty-six inches high and 1.5 inches thick. It features a single walled, 36-inch rim, and an easy to work with, bolt on axle system. Its UCP spokes fight against corrosion, prolonging that enviable mountain bike sleekness. The wheel also features a silver hub, silver spokes, and a silver rim. 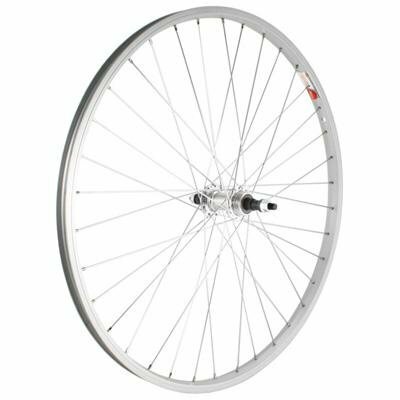 The Sta-True Silver Rear Mountain Bike Wheel is designed for bikes with six or seven gears in the back also known as 18-21 speed bikes; it features a freewheel 6-7 loose bearing hub. The Sta-Tru also has 26.5-millimeter wide alloy rims, meaning it is ideal for casual, fast mountain biking, but not designed for scaling more advanced, professional level mountain terrains. This mountain bike rear wheel features an alloy rim that has been specially designed to allow for very fast riding over entirely smooth for mountainous terrain, but riders should be advised that the wheel is not designed to be ridden over professional level mountain off-road courses. Therefore, the Sta-Tru is an excellent rear mountain bike wheel option for a pre-professional rider, a casual rider, or any level rider who is not riding the most advanced terrains. This makes it one of the superb bike wheel choices for riders looking to upgrade or update their excellent mountain bikes. 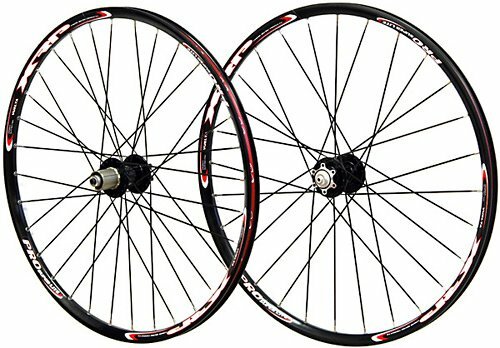 The Vuelta Pro Mountain Bike Wheels are some of the most impressive mountain bike wheels on this market, and for a good reason: their top of the line design and impressive detailing make them some of the most attractive looking and well-operating mountain bike wheels available online today. The red and black coloring of the Vuelta wheels makes them a standout stylistic accent to your bike. Vuelta wheels are also well known for their high quality and widespread use Popular, stylish, and much sought after the Vuelta mountain bike wheels are the cool kids of the mountain bike wheel world! This mountain bike wheel is specific in that it works with disc brakes only. This particular order of wheels comes as a set, so it is imperative that the bike features disc brakes. If you are building your own bike, you may choose to opt for disc brakes just to ensure that you can use this Vuelta wheelset; the Vuelta wheels and trademark stylishness are that enviable. The wheels themselves feature bladed aero spokes that are ultra light and ideal for fast ridings, like the road or cross country racing. The wheel’s 2.8-millimeter gauge aero spokes are more aerodynamic than the average mountain bike wheel spokes, which is why this Vuelta wheelset is favored by so many expert riders across the globe. The super-fast precision bearing hubs are sealed cartridge and super smooth, as per all Veulta manufacturing. The wheels are, in fact, the second lightest XC wheelset in the entirety of the Veulta line. The Pro SuperLite wheels are also each stress relieved by the skilled hands of the top of the industry craftsman not once, not twice, but three times. That’s why these mountain bike wheels offer such specific and reliable riding. This mountain bike wheel boasts a 25-millimeter rim and a three cross patterning. That topped with the cro-moly release and 135-millimeter spacing make this one of the most well-made. With its top quality make an impressive, aerodynamic engineering, the Vuerta Pro Superlite high-level wheel for cross-country racing and multi-terrain riders. This Bicycle 26inch Milling trilateral Alloy Rim Carbon Hub Wheels are the best mountain bike wheelset for the mountain biker who needs the fastest, most professional ride. These wheels are designed for a wide range of differently speeded bikes, allowing a plethora of different leveled riders to worship this particular brand and make of mountain bike wheels. The simple black wheel coloration makes these bike wheels easy to match to any color of mountain bike, and the incredible strength they possess allows all different builds of riders to enjoy their professionalism. That is why so many different level riders of so many different body types opt for these MTB Mountain Bike Wheels. 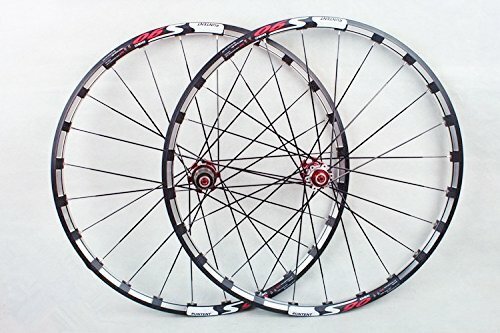 These mountain bike wheels sell as a set, which is a great option for any riders who are building a bike from scratch or looking to replace both wheels at once. They are suitable for many different speeds; the MTB wheels work for all speeds from 8-11, and will also work for 7-speed bikes, so long as you implement the usage of a washer. These mountain bike wheels function with one to 2.3-inch tires and are suitable for six holes. They feature a sealed bearing carbon hub that offers increased strength and security. This sealed bearing carbon hub also ensures that the wheels feel extremely light while maintaining that necessary durability. The flat spokes provide a Tensile strength of an impressive 350 kilograms, and the wheels offer quick and release tapes that will help improve your control. For an extra perk, if you order these wheels online, MTB guarantees that they will arrive in mint condition, without even the slightest damage. If you are looking for top of the line, professional level mountain bike wheels, look no further than the MTB Mountain Bike Wheels. While they only work with specific mountain bike designs, they are undeniably some of the ideal wheels available for anyone from beginner to professional level. Now that you have learned up on some of the bike wheels that the current market has to offer, you are well equipped to make a choice that best suits your mountain biking needs. Whether you choose to opt for a more basic yet sleek wheel, like the Sta-Tru mountain bike wheels, or whether you choose to go all out with the lightness and sturdiness of something more professional level, you can rest assured that you are choosing the best mountain bike wheels for your needs.